Get physicians involved in the CDI process through collaboration, tireless effort, and fact-driven discussions. Clinical documentation improvement (CDI) initiatives are an ongoing effort, but even the most devoted coders and CDI specialists can’t make the process perfect on their own. Queries and clarification requests will only go so far. For true success, physicians must fully participate in CDI programs. While getting them engaged in these efforts historically has been a challenge, some hospitals are finding new ways to make physicians more active players in the documentation game. Confronting physician engagement from a real-world perspective is a first step, says Lynette Kramer, RHIA, director and ICD-10 practice leader at Navigant Consulting, who points out that this is a difficult time to be a physician, with enormous pressure spread across many competing priorities. Acknowledging those draws on physician resources will help hospitals devise more effective ways to engage them. “It means we need to have the right messaging for them. Be aware and empathize with their situation,” she says, adding that physicians are adept at absorbing and acting on information quickly, making it important to be succinct and have tools handy to enable efficiency. The support of hospital administration is key, says Judy Cassetty, BSN, RN, CCDS, a CDI specialist for Barnes Jewish Hospital in St Louis. If one branch of leadership doesn’t demonstrate commitment, CDI efforts can become mired in politics or simply fall off the radar. “It involves the CEO of the hospital plus the chief financial officer because they are in charge of the HIM department,” she says. Add in the medical director for a full suite of support, and documentation has a much better chance of gaining visibility among physicians. Involving physicians in a manner that allows them to have some say in how CDI programs are implemented also may boost participation levels. “How that happens and to what degree varies from organization to organization, but I would characterize it as critical in terms of success over the long haul to make a positive impact in getting physicians engaged,” says Kathy Johnson, RHIA, vice president and general manager of data quality and coding compliance at Care Communications. Treating providers as internal customers when designing a program and communication are other valuable tactics. This approach may be helpful in getting physicians to see how their efforts fit into the big picture. Various incentives are available to entice physicians to take a greater interest in CDI efforts. Some go straight for their wallets. “There are hospitals that pay an incentive fee for hitting performance standards for documentation,” says Todd M. Husty, DO, FACEP, president and CEO of Medical Audit Resource Services. It’s a relatively simple and straightforward approach, one that is in lockstep with a hospital’s own revenue stream. 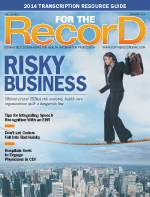 “If you look at the risk of overcoding and then the risk of undercoding, there’s a lot of money to be lost—or to not be gained that should have been—by not doing it right,” says Husty, who believes that sharing some of that financial incentive with physicians frequently can bring otherwise reluctant documenters on board with CDI programs. The program, which partially is being driven by the widening availability of care and quality metrics among the general public, first will focus on the hospitalists, who each will be assigned a code name. When reports are released, Hines says the physicians will learn which code is theirs so they can see how they’re performing compared with their peers and learn which areas are in need of improvement. No matter the type of incentive program, Johnson says its structure must be tailored to physicians and their tendency to be fact driven. “If you think about it, that’s how you make good clinical decisions for your patients,” she explains. Metrics reflected on a report card and query statistics outlined in contracts speak to the way many physicians already approach their jobs. “Providing the facts and what influence this process has on the overall success for the patient population is particularly important,” Johnson says. Is it possible to increase physician CDI awareness sooner, perhaps including it in medical school curriculum? Cassetty says that already is occurring to some extent. “Medical students round with their residents and attendings, so they’re learning on that level,” she says. These are opportune times for CDI teams to share their knowledge and gain valuable face time in an effort to ensure frequent interactions. “When they’re rounding—maybe daily, maybe just weekly—the CDI specialists are giving tips, giving ideas, and speaking as a partnership with that group,” Cassetty says. In addition, regularly scheduled lunch and learns offer medical students the chance to see CDI in action within the hospital setting. She says both approaches can be successful in large and small hospitals as long as the organization makes it a primary issue. No matter whether students have developed strong documentation skills or received only a brief introduction, Kramer says hospitals should make CDI a priority. “Certainly when you’re bringing medical students or residents through your program, you should have an on-boarding process for them,” she says. Unfortunately, medical students’ good intentions quickly give way to real-world time crunches. Ironically, students’ first forays into documentation typically are long-winded affairs. “They haven’t learned what’s important and what’s not, and what really is necessary to write out and what is not,” Husty says. Once formal training ends, the newcomers’ continuing education is in the hands of experienced but incredibly busy physicians. “They start being taught how to cut corners. And by the time they’re residents, they have even more work to do,” he says. The approach was designed to make CDI as easy as possible and have students come away with a clear understanding of what was expected of them. Johnson says mentors, physicians with solid documentation skills, and CDI specialists often were available to help answer students’ questions. Despite technology’s prominence in today’s health care scene, Cassetty says face-to-face meetings between physicians and CDI specialists still should be a vital component in documentation improvement efforts. It’s particularly important for medical students whose experience with real-time interactions probably has been limited. For example, attending quarterly CDI department meetings provides physicians with insight into important documentation concerns, key trends, and successful strategies. “I think CDI is that link between the coders and the providers,” Cassetty says. Avoid generalities, Johnson says, adding that data-driven examples that relate directly to how the physician is—or isn’t—documenting are effective. “Show them trends over time and look at patterns,” she notes. Reports should feature positive feedback, areas for improvement, and notes on whether documentation is clear, comprehensive, and completed in a timely fashion. “You’re reinforcing what you want more of and then problem-solving what you want less of,” she says. Brevity in daily interactions will go a long way toward keeping physicians engaged and responsive. “It is hard to capture them for more than a minute or two on the floors, so you have to make your conversation brief and present your documentation question in a concise and thought-out manner,” Hines says. Conversations may take only a moment, but each one helps establish credibility between CDIs and physicians and will foster better dialogue when issues arise. Hines says her team is planning more formal meetings with different physician groups to cover ICD-10 education. “We will use this opportunity to introduce new documentation requirements specific for each specialty as well as reinforce general good documentation practices,” she says, adding that the time also will be used to network with physicians and participate in more in-depth discussions about documentation issues. Husty concurs that the transition to ICD-10 is an ideal opportunity for CDI teams to cultivate physician engagement strategies. Because physicians are “trained by inches,” Husty says a persistent CDI team likely will get the best results despite the potential for some awkward situations. “It means people taking a physician’s own specific findings back to them over and over again,” he says. Although such dedication doesn’t guarantee success, a sustained effort has a far greater chance of improving physician documentation. “You can’t just do a lecture, you can’t just do the little packets that you send to them,” notes Husty, who says some physicians actually will reverse direction if they see a CDI specialist coming down the hall. Figuring out how to make every discussion productive can help change that habit, he says. Despite of their competitive nature, physicians can and do support each other when it comes to documentation improvement. Kramer says finding a champion to lead the charge is key. “A champion is a physician that has a passion for clinical documentation and its importance and is able to link the various points together to understand that if you do quality documentation, then you are going to reap these benefits,” she says. A physician champion, whose role is separate from that of a physician advisor, should be respected within the organization and have sufficient influence to help change peer behavior. Many physicians have figured out that, absent a knowledgeable champion, one colleague could be the source of the entire staff’s poor documentation record. Husty occasionally sees physicians helping each other of their own volition, but he more often encourages them to seek out CDI specialists should they have questions or want to improve their documentation. “I tell physicians the CDI specialists and those HIM folks that are going through your charts know what you’re doing right and what you’re doing wrong. If you decide you would actually like to do this better, I would enlist their help,” he says.